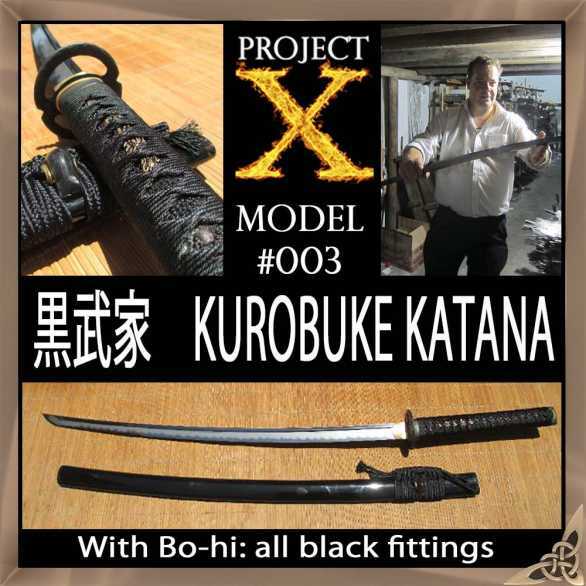 The Kurobuke, model 003 of Project X Japanese, means "Dark Warrior" in reference to the all black fittings and is inspired by the legendary swordsman, Miyamoto Musashi. Indeed, the iron tsuba is a design created by the "Sword Saint" himself and is one of my personal favorites. 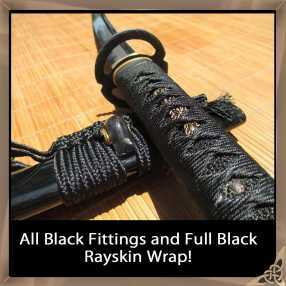 Complimented by all black theme, it is one very mean looking sword - the full rayskin wrap is blackened, even the buffalo horn end cap and sageo knot on the saya - and the blade itself features a hand carved bo-hi (fuller/blood groove) which combined with the lighter sukashi tsuba results in a very fast sword that cuts with extreme precision. Quite simply, Project X is a collaborative effort between Ronin Katana, SBG and Longquan's top sword forge - all working together to create the absolute best quality Katana ever made outside of Japan. 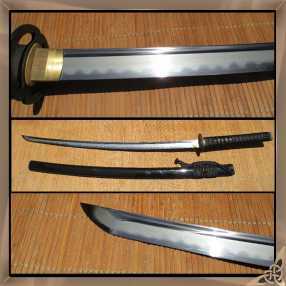 The blades of these swords are hand forged by Certified Master Smiths in the soshu kitae tradition (seven panel steel). This school was developed by the legendary Japanese smith Masamune, and combines panels of hard, medium, and soft steels. Soshu Kitae Lamination - far right. 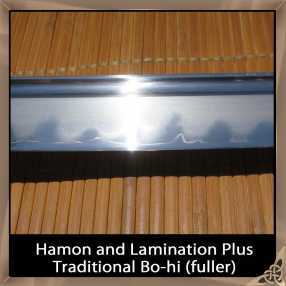 It is by far the most complex and desirable lamination technique. The core of the blade is formed from softer, more malleable steel giving it exceptional flexibility. A layer of slightly harder steel is bonded to each side of the core to add support. 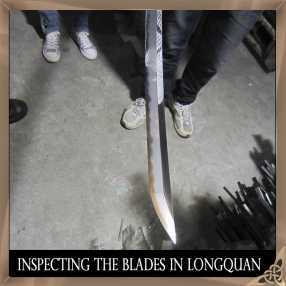 The last layers are a very hard steel bonded to the top, bottom, and both sides of the core forming the ha (cutting edge) mune (back edge) and shinogi-ji (blade flats). This form of laminar construction provided for a sword that could be sharpened to a razor edge due to the hardened steed used for the ha, but was extremely resilient to battle damage due to its softer more flexible core. As a by product of the process, the blade features not only a hamon, but also attractive lamination lines, resulting in a very active and attractive blade with criss crossing lines and interplay between the lamination and hamon. However, the quality of this sword does not end with the blade - but is complimented with premium fittings such full rayskin wrap for added tsuka core integrity (traditionally most Katana had a full rayskin wrap, which helps reinforce the tsuka and makes the ito wrap grip better to the handle). The ito itself is made from premium grade silk ito wrapped using the traditional and time intensive hishigami process creating an extremely tight and even binding. 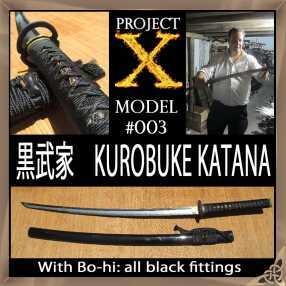 But the upgrades do not end there, this sword has the works - such as additional coatings of laquer on the saya for a richer, more durable sheen, buffalo horn kurikata and saya fittings, thick, ultra strong sageo - all iron fuchi,kashira and tsuba - you name it, this sword has it - no expense has been spared! 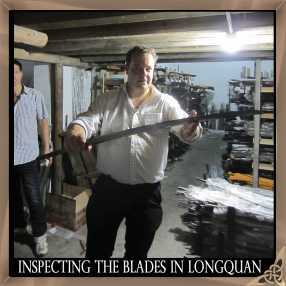 I personally endorse these swords as the best of the best and in September 2012 went to the forge in Longquan to oversee production and was very happy with the results (In the gallery you can see some pictures of me inspecting the finished blades). 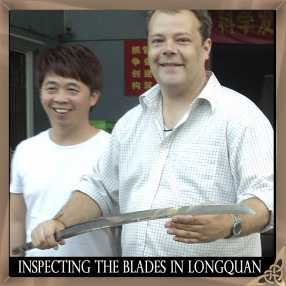 At $1,000 this offer is not for everyone - but the value for money factor is off the scale - typically you would pay at least twice as much for a sword like this, but that is not how SBG does business..
At the end of the day, there really is nothing else that comes close anywhere near this price point.. If you want the best - THIS is it..
Wrap: Premium Silk ito over FULL ray skin wrap. Suitable for sword practice in a traditional martial arts setting or high end display. Heirloom Quality. 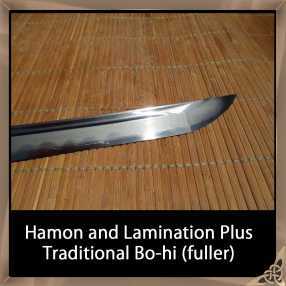 Certified Master Smith Forged Soshu Kitae Laminated blade, differentially hardened with real hamon and high end Japanese finger stone art polish to bring out the blade activity. Complimented with premium grade fittings. I.e. FULL Rayskin Wrap under silk ito tied using hishigami triangles for maximum tightness and strength. Iron fittings based on actual antique swords. Double coated saya with real buffalo horn Kurikata, Koiguch and Kojirii with premium sageo.